When someone you know, be they a friend, family member or co-worker retires it is a special occasion. One of the things most of us do is to wish them success and congratulate them on having retired. This can be done in person or with a message in a retirement card. But finding the right words can be difficult. You may want to express how much they mean to you or how much they will be missed. You will probably want to wish them all the best and to offer your congratulations on a lifetimes or work. 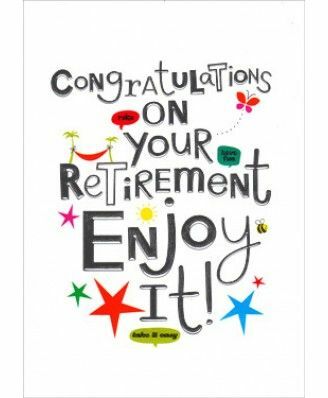 If you are lost for what to say for retirement congratulations words then we have provided many different examples of ways to phrase your sentiments perfectly for a card message or speech. 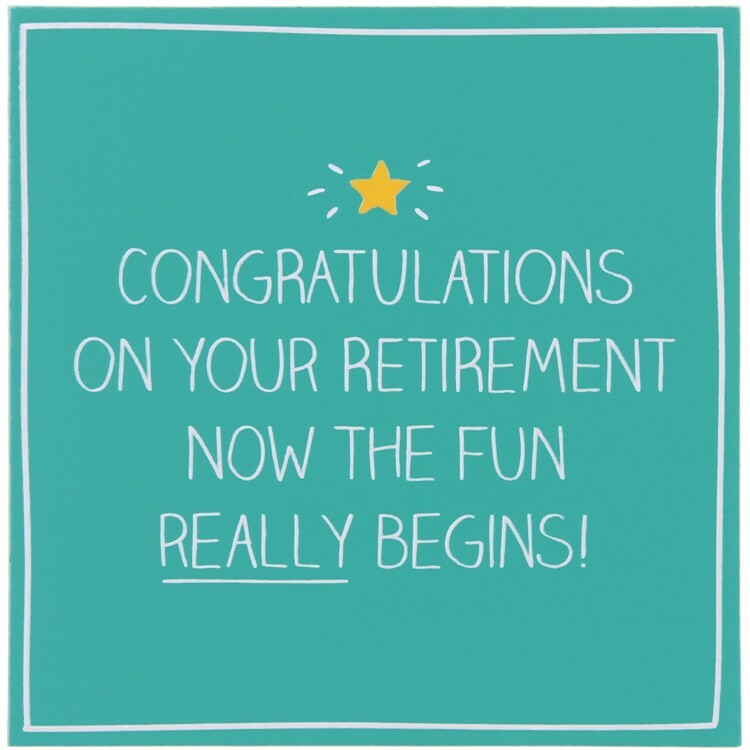 So below you can use one or more of our selection of retirement congratulations messages for your card or speech, either directly as they are or changing them to fit your own circumstances. Congratulations on your retirement; the end of an era but the start of a whole new chapter. Retirement is when life gives you the greatest reward there can ever be – peace of mind. Congratulations. Retirement is an opportunity that life gives you to stop complaining about not having the time or chance to do what you always wanted. Congratulations. Don’t retire with regrets of what you couldn’t do. Retire with ambitions of what you will do now. Congratulations. Wow, you look way too young to retire, but congratulations on beginning the next phase of your life. Congratulations, may you enjoy your retirement to the fullest. Congratulations on your retirement. Thanks for your years of dedication and hard work. Congratulations on your retirement! If you ever get bored, give us a call us and hang out with us. Congratulations on your retirement, we’re so happy for you. Congratulations on your retirement. Now you can use your time to relax and enjoy all the things you haven’t had time for before. Congratulations, but we will miss seeing your face. Thankful for the time we all shared together. Congratulations! To my best friend, I watched you work so hard over the years. Congrats on retiring, you have certainly earned it and more! After seeing you accomplish so much, I have a massive respect for you, my friend. Congratulations. Congratulations on your huge accomplishments! You deserve everything and more. Congrats, my friend! Excited for additional time with you during this retirement! Congratulations! Congratulations on your retirement and good luck! Congrats on your retirement…wishing you lots of love, peace, good health, wealth and happiness! So grateful for your commitment through the years. Congratulations! This card is just a tangible expression of my heartfelt sentiments. I will miss you and all that you brought to the workplace. Congratulations. You will finally have time to ferret out that special fishing spot or to sleep through an afternoon game on TV. It couldn’t happen to a nicer guy. Congratulations on your retirement. The staff has never been “on the same page” about business plans or implementing policies, but we are all in agreement on this: you will be missed. You have a wealth of information and experience that can never be replaced. So, if I need you, can I put you on “speed dial?” Congratulations on your retirement. Congratulations on your retirement. Have an adventure in your new life. Congratulations on your retirement. Your experience, knowledge, dedication and presence will be sorely missed. Best of luck in your brand new adventure! All your hard work and years of service have finally paid off. Congratulations on your retirement. Enjoy your new free time doing all the things that you want to do. Congratulations on your retirement! Can you imagine hours and hours of enjoying your hobbies, days and days of doing whatever you want? You are one lucky person. Best wishes on your retirement. Best wishes to you as you take up the new role of retiree. It is a tough job in case you did not know. Best wishes on your retirement! May the many years ahead bring you all joy and relaxation. Congratulations on your retirement! To one of the best people that the company/office has ever had. Congratulations on your retirement! You are an embodiment of optimism and hard work. Thank you for inspiring us every day at work. We will miss you! Congratulations on your retirement! I will never forget all the things you have taught me whether at work or in life. You are one of the reasons I have fun working. Congratulations! Happy retirement! The office will not be the same without you around. You will surely be missed! Congratulations on your retirement! Congratulations on retiring. It has been a pleasure working alongside you, and I wish you all the best. Thank you for everything you have done! Retirement is the beginning of the time when you can sit back and give advice to others, even though you never followed it in your own life. Congratulations. Safe travels, good luck, and congrats on your retirement. As you retire, remember that you have left behind a legacy of encouragement, achievement and work ethic that will always be part of your co-workers. Congratulations. Who said life is boring? You are beginning the most exciting phase of your life as you begin your retirement. Congratulations!